What if you had the chance to become your city’s first Black mayor, or you had the chance to give an old man back the house you stole from him in a one-hundred-percent illegal land grab, but you could not do both. Which would you choose? 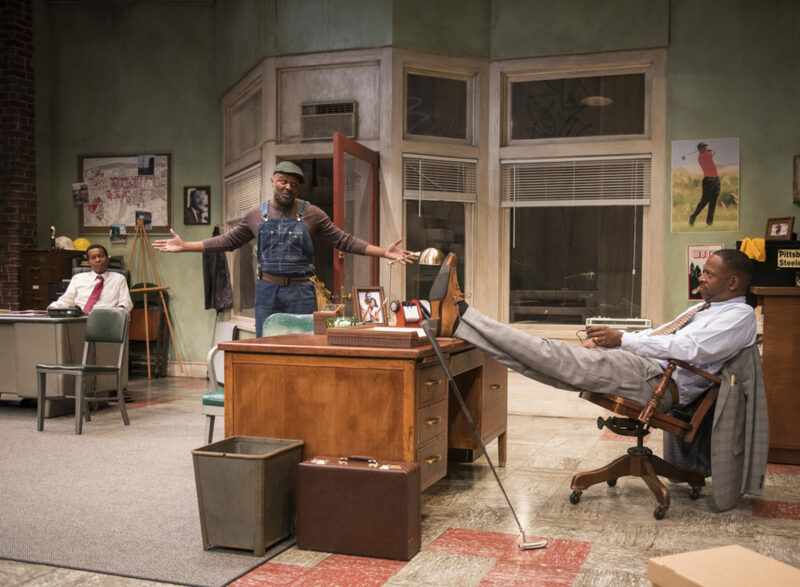 The late playwright August Wilson brilliantly asks this question, and many other difficult and relevant questions, in the tenth and last play of his American Century Cycle series, Radio Golf, playing now through October 6 at the Court Theatre. Wilson’s simple yet layered language drives straight to the heart of ambition, greed, loyalty, family, and tradition, while examining the pros and cons of gentrification, business acumen, race, theft, radio, and golf. This is the fifteenth play Ron OJ Parson, resident artist at Court Theatre, has produced for the theater, and the seventh August Wilson play. It is also Parson’s twenty-fifth August Wilson production. Parson’s work and reputation precede him, and he brings the same nuanced, layered genius to directing that Wilson brought to playwriting. Here, Parson directs Wilson’s story with humor—though without making it a comedy. And although the story is not a comedy, whether or not the play is a tragedy is left for the audience to decide. Parson’s ensemble cast members each give standout performances. Allen Gilmore delivers the likeable man with a dilemma, Harmon Wilks. Ann Joseph plays his dutiful but conflicted wife, Mame Wilks. James Vincent Meredith becomes the man you could love to hate as Roosevelt Hicks. And though ensemble casts tend to shy away from declaring a lead performer, the performances by actors James T. Alfred as the “you really don’t want to mess with me” type Sterling Johnson, and Alfred H. Wilson as the wise and charming Elder Joseph Barlow, both vie for lead position. Maybe it’s the “Alfred effect”? The show’s magic includes impeccable costumes and a spare-no-expense Court Theatre set that is mindful of the most minute details, from the lighted billboard perched above the office rooftop to the tiny Pittsburgh Steelers emblem posted on the office door. Radio Golf is a timely and heartfelt story, reflective of the issues of blight and renewal faced by many major metropolitan cities. Though set in the Hill District of Pittsburgh, the story is eerily reminiscent of Chicago’s Hyde Park and Pilsen neighborhoods. Residents living close to the Court Theatre in the brand-spanking-new, gentrified Hyde Park should definitely not miss this show. In particular, anyone who has not noticed or who has not been affected by the recent and continuing changes to “downtown” Hyde Park—and the fallout effect on Hyde Park’s surrounding blocks—should make plans to see Court Theatre’s Radio Golf at least twice. Radio Golf. Court Theatre, 5535 S. Ellis Ave. Through October 6. $38–$74. Thursday–Saturday, 7:30pm; Sunday, 2pm and 7:30pm; High School Matinee performance Wednesday, 10:30am. (773) 753-4472. Nicole Bond is the Weekly’s Stage & Screen editor. She last wrote for the Weekly in August about the Black Ensemble Theater’s production of Rick Stone: The Blues Man. Congratulations to Nicole Bond, my longtime friend and writing workshop comrade for scoring a perfect 10, in my book, in her review of this Court Theater production! Thank you Don. I hope you can see the show before it closes on October 6, if you haven’t already!